Another light, refreshing summertime meal using the abundance of fresh fruits and veggies of the season. Oh, hail no! Not tonight! I was getting ready to grill because the clouds went away, the sun had come out, and I had the fish ready to go. As I was getting ready to take the fish outside, the weather report came on advising of severe storms and large hail only 15 miles from the house coming in our direction. Then the skies darkened considerably. So we watched the local weather channel for a while. The skies opened up and we got a heavy downpour of rain. It lasted all of about 5 minutes. The skies cleared up and life was good. Somehow, some way, the weather is still holding up for us with temperatures under 100 F and we luckily dodged a terrible hail storm yesterday. So, once again, it was grilling night. No fuss, no mess. We like it that way and grouper fish was the protein of choice for the evening. Grouper belongs to the Sea Bass family (Serranidae), one the largest fish families with over 400 species. The grouper fish is found in the waters of Florida and the Mid-Atlantic States as well as South America, Central America and the Gulf of Mexico. There are many different types of grouper, i.e. Black grouper, Comet grouper, Gag grouper, Giant grouper, Atlantic goliath grouper, Miniata grouper, Nassau grouper, Saddletail grouper, Scamp grouper, Snowy grouper, Tiger grouper, Warsaw grouper, White grouper, Yellow Edge grouper, Yellowfin grouper,etc. The list goes on and on and on. More than likely, the grouper you find in your local market are either Red grouper or Gag grouper. Gag grouper is generally marketed as Black grouper as they are very similar in taste and texture. More importantly, no one would buy it if it were, in fact, marketed as Gag grouper. Blech! If you have never tried grouper, it is a wonderfully light, mild tasting fish somewhat of a cross between bass and halibut. 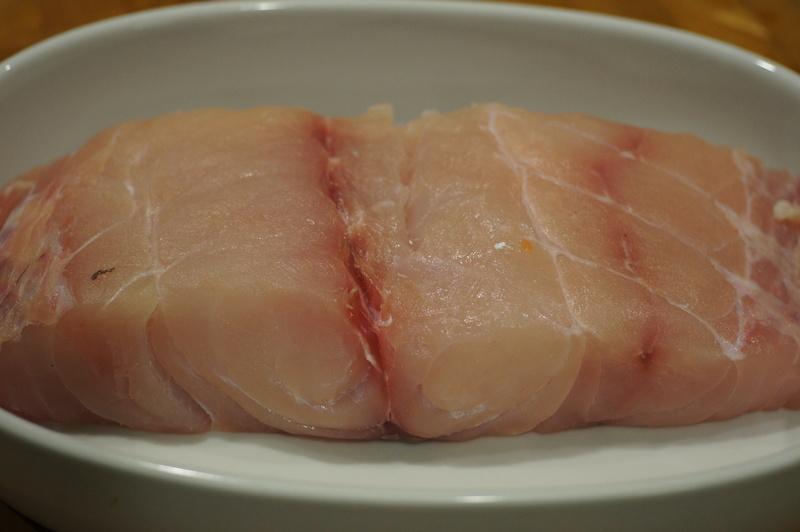 Red grouper is not quite as firm and has a milder, sweeter flavor than Black or Gag grouper and is preferred by many. Grouper have a high oil and moisture content which makes them go very well with a number of different dishes and cooking techniques. It cooks up very firm, with big fluffy flakes. You can grill it, bake it, poach it, steam it, sauté it, broil it and use it in soups and chowders. Probably the most preferred way to cook it is grilling it. 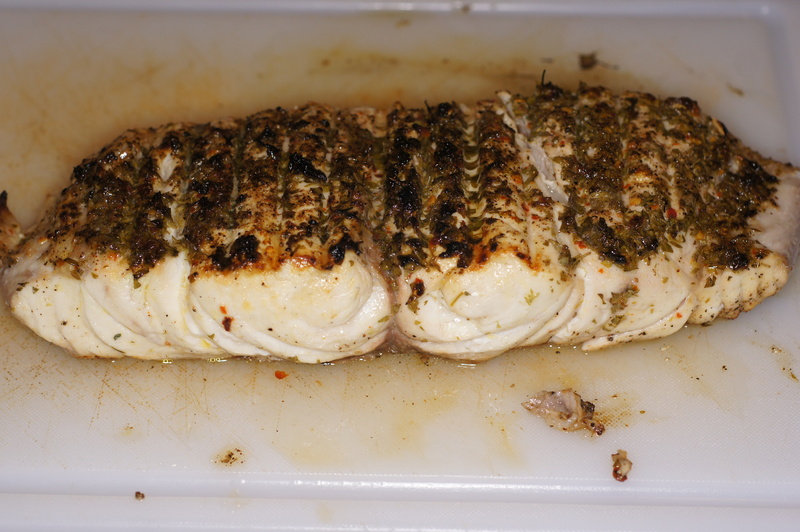 The fish is done when the meat becomes opaque and flakes easily with a fork. The general rule of thumb for baking grouper is 10 minutes per inch of thickness with the oven set at 400 – 450 F. I grill it over medium heat and the cooking time is roughly the same as that for baking. Also, remember with any protein the residual heat from the cooking process continues to cook the protein after you remove it from the heat. So it doesn’t hurt to remove the fish a little before it’s done because it will continue to cook while you get everything together for plating and service. This was a perfect summer meal. I love grilling in the summer when the weather permits. I simply love the flavor that grilling imparts to foods. Fresh tomatoes and cucumbers are in abundance and the lovely herbs in the backyard are growing so nicely. A little grilling, a little freshness and succulent brightness. This meal had it all going on. 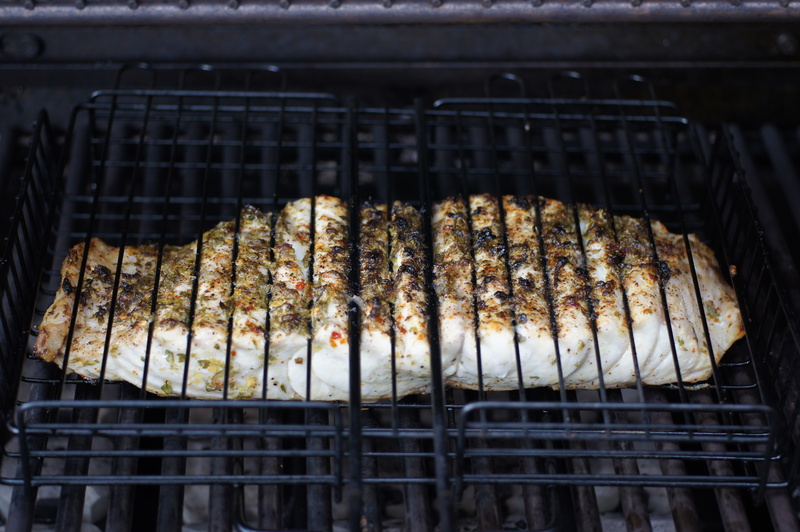 Next time you’re in the mood to grill some fish, give this recipe a try. Place the tomatoes, cucumber and basil in a bowl. Add salt, mix and set aside. Put the lemon juice, olive oil, garlic powder, 1 tsp salt, finely chopped herbs, and crushed red pepper flakes into a small bowl and whisk vigorously to emulsify. 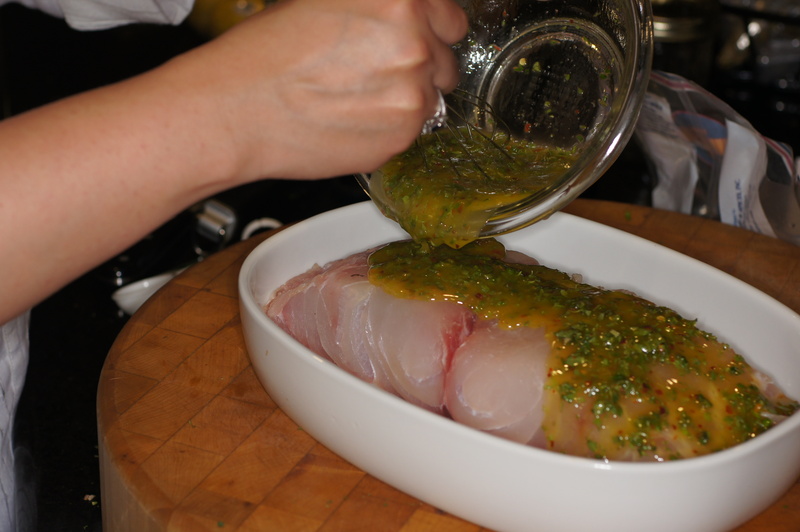 Place the grouper in an appropriately sized baking dish. Cover the fish with plastic wrap and put in the refrigerator for 30 minutes. 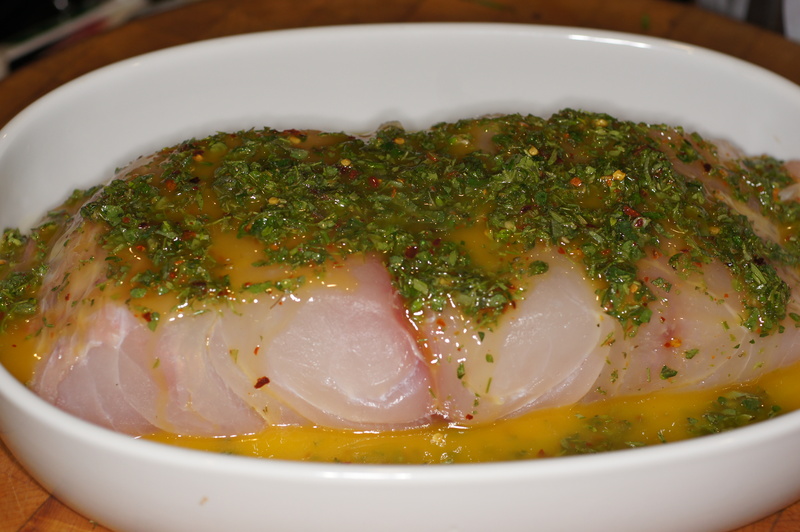 Because the marinade has a high acidity from the lemon, do not marinade the fish too long as you will make ceviche. After 30 minutes, remove the fish from the refrigerator and place in a grilling basket. 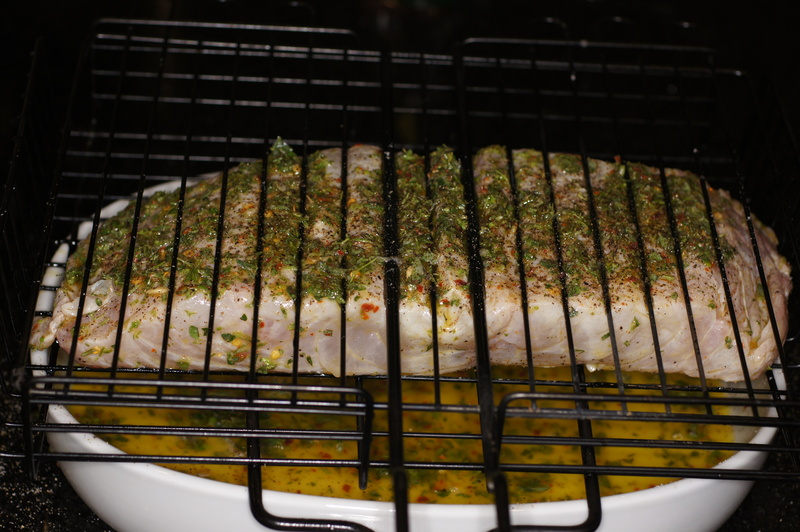 Cook grouper in a preheated grill over medium heat for 6 – 8 minutes. Turn the grilling basket and cook the other side for another 6 – 8 minutes. When fish is done, i.e. the meat is opaque and it flakes easily, remove from the grilling basket and let rest for a couple of minutes. 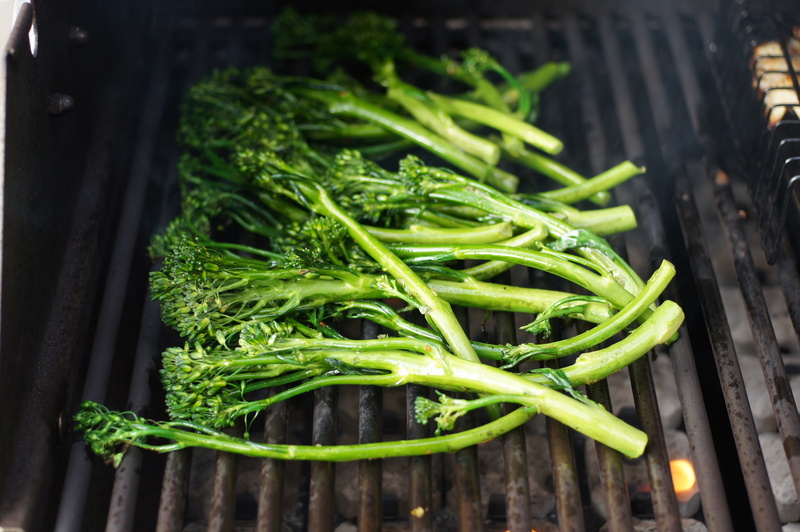 When the fish is removed from the marinade and placed in the grilling basket, add the broccolini to the marinade and coat. 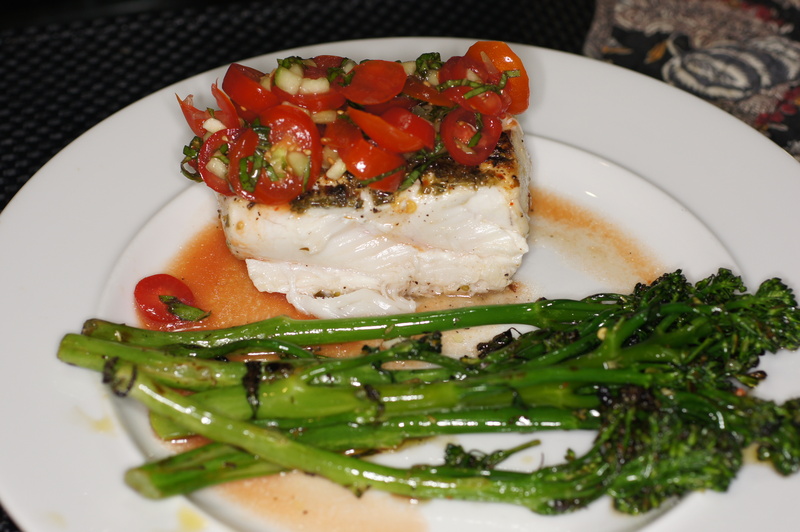 When you turn the fish to cook the other side, add the broccolini to the grill. Grill the broccolini turning it periodically to lightly char all sides. When the grouper is done, remove the broccolini and return to the marinade. 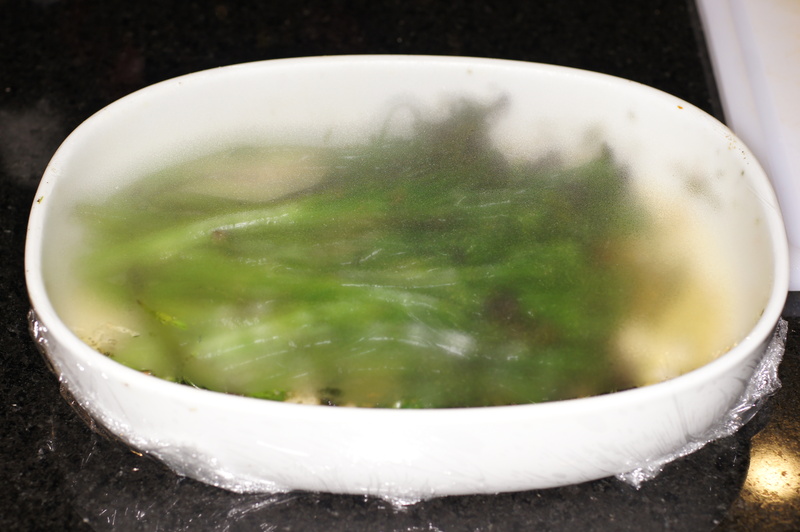 Cover with plastic wrap and allow the residual heat to finish steaming the broccolini resulting in a beautifully al dente doneness while preserving its gorgeous green color. Cut the grouper into 5 or 6 pieces. 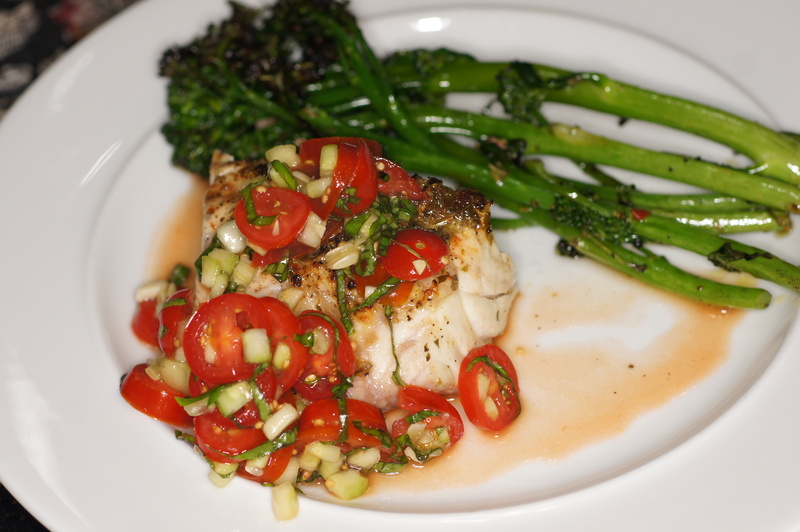 Put the grouper on the plate and top with the tomato, cucumber & basil salad. 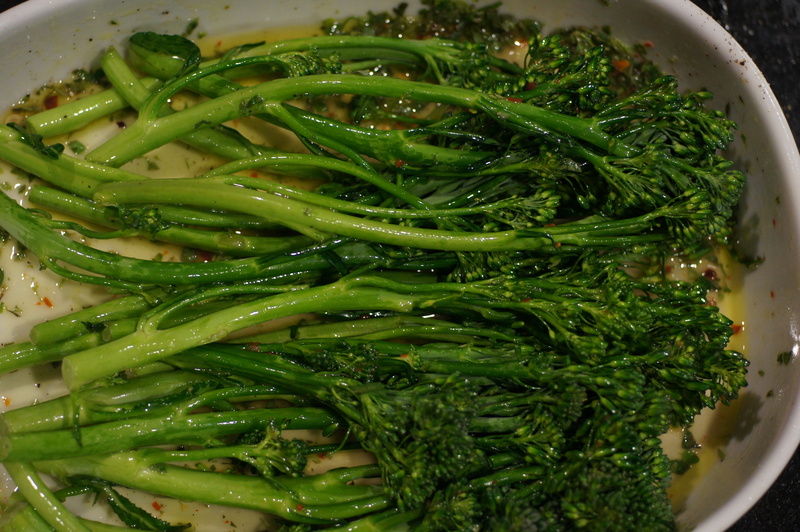 Place several stems of broccolini on the side. Serve and enjoy!